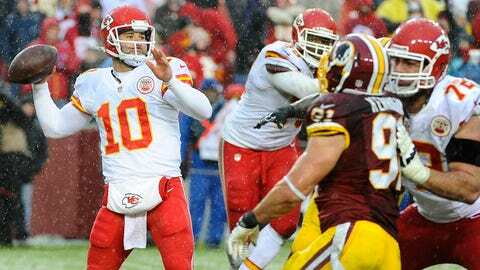 Chiefs quarterback Chase Daniel was still getting over Mizzou's loss to Auburn the night before when he faced the Redskins on Sunday. Within minutes of Missouri’s disheartening loss to Auburn last Saturday in the SEC title game, the criticism of Missouri coach Gary Pinkel started pouring in on Twitter. "That one’s all on Pinkel!" tweeted one fan. "Pinkel will never win the big one. Gotta go!" another tweeter bemoaned. "It’s definitely unfair," Daniel told FOXSportsKansasCity.com. "The people on Twitter or on social media really don’t know what they’re talking about. They haven’t lived it day in and day out. They’re fans, and we appreciate them, but Ã¢ÂÂ¦. "What matters the most is the guys inside that locker room and the program itself. And what (Pinkel) has done there speaks for itself. Look at what’s he done, I mean, he went to seven or eight straight bowl games before last year? He keeps raising the bar and keeps getting better." "I think he’s a great coach," Daniel said of Pinkel. "He’s done a heckuva job since he’s been there, the 12 or 14 years he’s been there. He’s grown it from the ground up, it’s his baby, and he takes great pride in that. "He wants national respect more than anything, and I think he’s got that. And the program produces a lot of NFL players and keeps getting first-round picks. You can’t say enough about that." "I was in the tank for our (Chiefs team) meetings that night," he said. "But it obviously felt better the next day when we won. But it was hard that (Saturday) night. "Still, this was one of the best teams in Missouri history. That’s a heckuva accomplishment." "It hurts," Daniel said. "You’re so close and you work so hard, and you’re just a half away or a quarter away, and then it all slips away. That’s what you go to college for and play football — to get a chance to go to the title game. It’s tough when you’re so close and you miss out on it." "There are some similarities," Daniel said. "We were disappointed (about not being in the national title game), but we bounced back for the Cotton Bowl and played really well. That was important to us. "Like I told our seniors at the time, you gotta finish out. You gotta set the tone for next year. You don’t want to end your career with a loss. I’m sure that’s the message for this team’s seniors." "Hopefully, these guys go there and finish strong, too," Daniel said.